The Eat a Red Apple Day is observed on December 1. It is a perfect occasion to remind yourself that there are healthy snacks that are also tasty. Everyone knows that an apple a day keeps the doctor away. This phrase is believed to have been coined by professor J. T. Stinson. He was a notable fruit specialist and the first director of the Missouri State Fruit Experiment Station. Stinson said this phrase at the 1904 St. Louis World's Fair to promote apples as a healthy snack. Another theory claims that this proverb was coined by Caroline Taggart from Pembrokeshire, Wales. The proverb lately developed into a marketing slogan by American apple growers. Actually, it doesn't matter who coined the proverb. 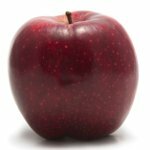 What does matter is the health benefits of apples. Apples contain significant dietary fiber, vitamin C, calcium, iron, manganese, magnesium, potassium, phosphorus, sodium, and zink. Eating apples can help you boost your immune system. Apples are cultivated all over the world, there are thousands of apple cultivars used for eating, cooking, or making cider and other beverages such as Calvados. Some of the well-known of red apple varieties are Red Delicious, Gala, Ambrosia, Ida Red, Macoun, Winesap.